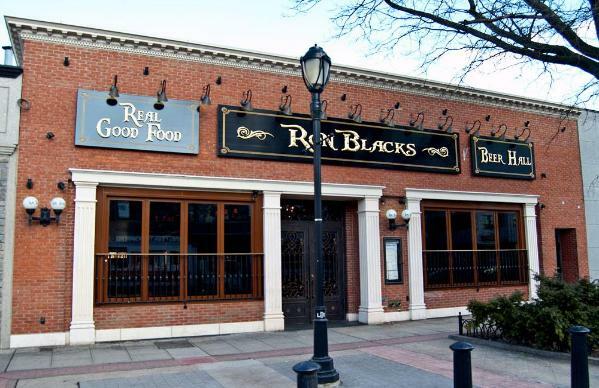 Gooseneck sign lights SL501A are shown at “Ron Blacks” restaurant in White Plains, NY. Hammerworks developed this smaller custom version of the SL-501 to meet zoning code requirements for fixture extensions. Choose exceptional quality handcrafted Gooseneck Sign Lights from Hammerworks! 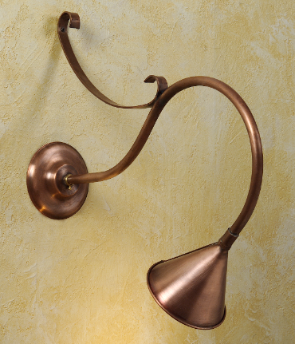 This handsome Gooseneck Lighting Model SL501A is expertly constructed with solid copper for long lasting durability. More importantly it will light up your storefront in style. Most notably in addition to copper we handcraft Gooseneck Lighting in your choice of solid brass or verdigris finish. Furthermore on most models we powder coat the steel arm black for a striking contrast. Not only that we offer two distinct shade styles. Therefore you can select either the streamlined cone style or the charming “pie plate” hand crimped round shade. Since we offer Sign Lights in a variety of sizes and arm configurations you have endless options. Going beyond commercial applications Gooseneck Sign Lights are versatile in a variety of residential settings. For example Gooseneck Barn Lighting SL503S is ideal on any garage or other outbuilding. Similarly Gooseneck Doorway Lighting SLS508 makes a charming addition to your front entryway. Several models add a dramatic effect when installed as Interior Gooseneck Lighting. First of all with its’ straight arm Pendant Fluted Shade Light SLS509 makes ideal task lighting. Merely group a few together over kitchen counters, islands bathroom vanities and even pool tables. Likewise restaurants often use them over salad bars or booths. Going further the wall mounted Copper Sign Light: SLS507 coordinate nicely to complete the look of your space. Thus from interior commercial applications to residential kitchens and beyond Gooseneck Sign Lights provide a creative option for any interior lighting design scheme. In conclusion it is evident Outdoor Gooseneck Sign Lights offer many solutions to your home & commercial lighting needs. In addition to exterior illumination for signs, other successful applications of Sign Lights range from outdoor home, barn and garage doorways to kitchen, bathroom or pool table lights.